Birmingham have announced the signing of former Liverpool and Rangers defender Gregory Vignal on a one-year contract, subject to a medical. The 28-year-old left-back played under Blues boss Alex McLeish at Rangers and has impressed during his time on trial. 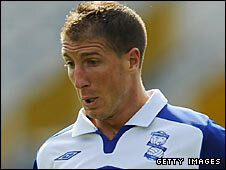 "He's a good athlete, mobile, strong and aggressive," McLeish told Birmingham's official website. "At Rangers when we won the league it was a very successful campaign for him, so I know what he can bring us." Vignal, who joins from Lens, will fill the gap left by David Murphy, who is recovering from a broken knee cap. He first came to England when he joined Liverpool as a 19-year-old and spent five years at Anfield, going out on loan to clubs in France and Spain as well as Rangers, where he first crossed paths with McLeish. Since then he has had a spell at Portsmouth and was also a loan at Southampton. "I've kept in touch with him and his family and I know he's been bursting over the last couple of years to get back to the top league," said McLeish.